Tom’s Urban has opened at the New York-New York Hotel & Casino serving breakfast, lunch, dinner and late-night. The casual dining concept is located on the casino floor, adjacent to the resort’s iconic Brooklyn Bridge, and spans more than 12,000 square feet. The design features reclaimed wood, warm colors and an outdoor patio. The menu showcases a blend of the world’s favorite street foods including American, Asian, Latin and Middle Eastern. Signature items include shrimp and grits with pork belly, crispy duck wings with hoisin glaze, filet mignon steak sliders and St. Louis ribs hardwood-smoked, slow-cooked, double-sauced and glazed. Among beverage options are handcrafted cocktails, craft beers, fine wines and signature “to-go” drinks. This new location is third in the U.S., joining others in Los Angeles and Denver. Tom’s Urban, 3790 Las Vegas Blvd. S., Las Vegas, NV 89109, 702-740-6969, 800-693-6763. 50 Eggs, Inc. has opened Yardbird Southern Table & Bar at The Venetian. Created by restaurateur John Kunkel, the 8,000-square-foot space is located in the resort’s Restaurant Row, and seats 180 guests throughout the main dining room and two private rooms. The menu features farm-fresh ingredients and Southern cooking. An expansive bar allows the 50 Eggs team added space to expand their beverage program, complete with a special on-site ice room where mixologists harvest hand-cut blocks for an array of libations. The new Vegas location joins Yardbird Southern Table & Bar’s original location on Miami Beach, which opened in 2011. Yardbird Southern Table & Bar, 3355 Las Vegas Blvd. S., Las Vegas, NV 89109, 702-297-6541. 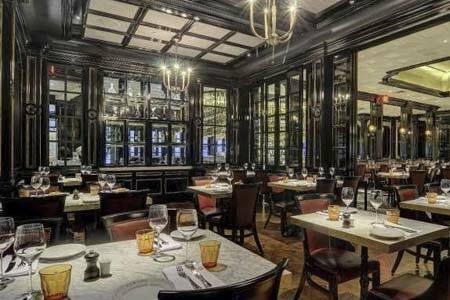 Michael Mina has opened BARDOT Brasserie, a French bistro, at Aria Resort & Casino. The new restaurant pays homage to the café culture of Paris offering traditional brasserie fare, such as foie gras en croûte, steak frites, roasted bone marrow with bacon marmalade and the BARDOT burger with Comte cheese, caramelized onions and a bordelaise sauce. Designed by Bishop Pass, the décor reflects the mood of early French film noirs where low lighting and dramatic shadows set the stage for an alluring and mysterious experience, and features an open kitchen, a Parisian storefront and 360-degree accessible bar with counter-to-ceiling brass shelving. BARDOT Brasserie, CityCenter, 3730 Las Vegas Blvd. S., Las Vegas, NV 89109, 866-359-7757. California Noodle House has opened in Downtown Las Vegas at the California Hotel & Casino. The restaurant’s tagline is “Signature noodle dishes … and so much more,” and offers a menu inspired by cuisines from throughout the Pacific Rim, including distinctive flavors from Korean, Thailand, Hawaii, China and Japan. Noodle dishes include beef chow fun and pad Thai; while soup offerings include Thai favorite tom kha gai, Chinese specialty won ton min and braised oxtail stew. Designed by Tandem Design of Las Vegas, California Noodle House is centered around an open show kitchen. The décor features a distinct Pacific Rim influence with clusters of paper lanterns, woven rope ceiling elements and abstract art. The hours of operation are from 5 p.m.-midnight, daily. California Noodle House, 12 Ogden Ave., Las Vegas, NV 89101, 702-385-1222, 800-634-6255. Caesars Palace has opened the new Forum Food Court featuring a quick-service format in five dining options: Di Fara Pizza from NYC; Phillips Seafood from Oceanside, MD; the first Strip location of Smashburger; the third Vegas location of Earl of Sandwich; and Tiger Wok & Ramen, serving Japanese and Chinese cuisine. Graeter's is a craft ice cream and gelato shop out of Cincinnati. Located adjacent to the Forum Shops at Caesars in the former Cypress Street Marketplace, the 14,900-square-foot-space also includes a new Starbucks and is open daily from 11 a.m.-11 p.m., with Di Fara open late till 2 a.m. on Fridays and Saturdays. Forum Food Court at Caesars Palace, 3570 Las Vegas Blvd. S., Las Vegas, NV 89109, 702-731-7110, 877-427-7243. In celebration of Chinese New Year, the Studio B buffet at the M Resort Spa Casino will serve a variety of Asian favorites. Selections will include poached chicken with ginger and scallions, beef lo mein, sweet and sour pork, chicken lettuce wraps, spinach and bamboo shoots, spring rolls and Chinese almond cookies. Studio B, M Resort Spa Casino, 12300 Las Vegas Blvd. S., Henderson, NV 89044, 702-797-1000. Rob Moore and Sean Griffin are doing a switcheroo. Moore was executive chef of Jean-Georges Steakhouse at Aria, and Griffin held the same position at Jean-Georges Vongerichten’s Prime steakhouse at the Bellagio, and now both chefs have switched restaurants. Moore’s resume includes positions at Lespinasse and Sammy DeMarco’s First and DeMarco’s Room in New York, and in Las Vegas at Sensi and Prime at the Bellagio, before moving over to Jean-Georges Steakhouse at Aria. Griffin’s resume is equally impressive, having held positions as chef de cuisine at the Four Seasons Hotel in Beverly Hills, chef de cuisine for Nero’s Restaurant at Caesars Palace, and as executive chef at Michael Mina’s Bourbon Steak in Scottsdale, Arizona, before he came over to take the executive chef position at Prime. Prime, Bellagio, 3600 Las Vegas Blvd. S., Las Vegas, NV 89109, 702-693-7223.